The 2018 edition of Whitewaller Dallas launched last week for the Dallas Art Fair (April 13-15). To celebrate the debut of the issue, featuring all you need to know in and around Dallas during the fair, Whitewall hosted a cocktail and dinner at Grange Hall in partnership with menswear brand ISAIA Napoli. 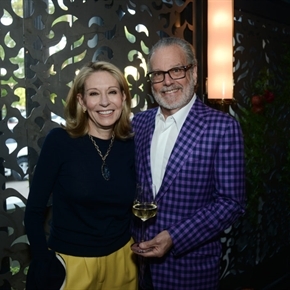 Joined by Whitewaller Dallas 2018’s Guest Editor Cindy Rachofsky, the philanthropist and art collector, guests included Howard Rachofsky, Christen and Derek Wilson, Brandon Kennedy, Sharon Young, Eva Helene Yazhari, Michael Klug, and ISAIA President James Shay. A new partnership between Whitewall and ISAIA was announced at the dinner around the luxury menswear brand’s San Francisco location. The boutique is located in the historic Frank Lloyd Wrightbuilding at 140 Maiden Lane. The space was designed around the inspiration for the Guggenheim museum in New York. At 140 Maiden Lane, ISAIA and Whitewall will organize quarterly art programming that will include exhibitions and a series of conversations on art and design with notable artists, galleries, institutions, and more.